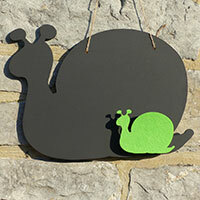 Comic snail shape chalkboard with a light green felt board cleaner. One of a range of costume and clothing shapes we cut as blackboards. We manufacture a large range of chalk blackboards, each board comes with a felt shape board cleaner that attaches to a peg mounted on the board that holds the chalk or can be used to hold paper notes. We can produce blackboards in sizes form 10cm high to 75cm high please contact us if the size you need is not here. If you can't find the design you want in the range here then please contact us and we will look at adding it.